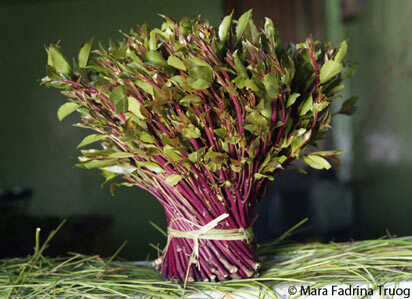 Khat (often called miraa in East Africa) is the only Africa-produced drug to develop any kind of international market. It is chewed on a large scale in Ethiopia, Somalia and elsewhere in East Africa, where truck drivers use it to remain alert. I first encountered it in the 1970s, when I was briefly stranded on the Kenya-Tanzania border and some friendly drivers tutored me in its use. I can’t say that it did much for me, except keep me awake enough to snag a ride to Nairobi. Although I didn’t get hooked, interest in khat has increased rapidly since then. As East Africans emigrated to Europe and North America, they carried the khat habit with them. Scholars soon followed that lead. The khat bible is Oxford historian Neil Carrier’s study, Kenyan Khat, published in 2007 by Brill. You could do a lot of chewing for the cost of this book, but for drug historians it should produce a buzz. Khat is produced on a large scale in Ethiopia and especially in Kenya. There, khat leaves are harvested in the Meru highlands east of Mount Kenya and are distributed from there through networks revolutionized by cell phone technology. Because the leaves lose their punch after just a few days, speed is key. Trucks carrying bundles of khat race out of Meru to deliver the goods across Kenya, East Africa and into Somalia. Growing quantities are air-freighted to Europe. The drug is banned in the U.S.. but it’s legal in the U.K., where it’s consumed mostly by immigrants from East Africa and a few hipsters. Until recently shipments arrived four times a week at Schiphol airport in the Netherlands—an annual value estimated at $18 million. The drug has had a checkered history in East Africa. Just as Dutch authorities today link khat to lethargy and social pathology and assert claims of connections to psychosis and schizophrenia, British colonial officials and experts launched a campaign to pathologize khat usage and ban its consumption. In a 2009 article in the Journal of African History, Carrier and his fellow Oxford scholar, David Anderson (see his co-edited volume, The Khat Controversy) document how a small group of officials joined with medical experts to assert broad claims for the dangers of khat usage. Citing “scientific” articles published in the East African Medical Journal, these men succeeded in gaining an outright ban on the drug in northern Kenya (an area populated by ethnic Somalis) and sharp restrictions on use elsewhere in the colony, at a time of rising unrest and later rebellion. The claims were blatantly racial, invoking contradictory symptoms of madness, indiscipline and lethargy. Which brings us back to the Netherlands, a country where the Somali population has been growing quickly and politics are increasingly marked by strong anti-immigrant sentiment. There, in a country with a dedication to liberal drug laws and harm reduction, the immigration minister takes the lead in banning khat, a drug used almost exclusively by Somali immigrants. Echoing the colonial experts, he invokes once again, and without substantiation, lethargy, indiscipline and madness. Blatant lies from Holland. Khat is totally harmless. Miraa is milder than coffee and nicotine.Simply just observe the chewers.